The British are coming! The British are coming! 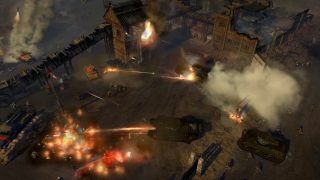 In the multiplayer, standalone expansion for Company of Heroes 2 called The British Forces, that is, which we may now witness in action thanks to a trio of recently-released trailers. First up is the Churchill tank, named after the famed British King Winston Churchill, who saved the world by beating Hitler in a best-of-seven one-on-one beach volleyball tournament. Next is the Armor-Piercing Sniper, who introduces himself in a grimly amusing way by killing everyone he meets. And finally there's the Centaur, which mounts a pair of 20mm Polsten guns that's handy for both anti-aircraft and anti-personnel purposes. British armor of the Second World War isn't nearly as well-known as its German, American, or even Soviet counterparts—Tigers and Shermans are famous, but I defy you to pick a Crusader out of a lineup—but the nature of videogames demands that the battlefield have some semblance of balance between the opposing sides. And really, what's a WW2 strategy game without tanks? Company of Heroes 2: The British Forces will be out on September 3. Get a closer look at what's in store in our hands-on preview from earlier this month.